A veteran astronaut crew representing the United States, Russia and Japan is returning back to Earth aboard a Soyuz capsule today (Nov. 18) to wrap up a four-month mission to the International Space Station. The Soyuz spacecraft undocked from the space station at 5:26 p.m. EST (2126 GMT) as both ships sailed 256 miles (412 kilometers) above northwestern China. The Soyuz is due to land on the Central Asian steppes of Kazakhstan at 8:53 p.m. EST (0153 Nov. 19 GMT) to return American astronaut Sunita Williams of NASA, Russian cosmonaut Yuri Malenchenko and Japanese astronaut Akihiko Hoshide to Earth after 127 days in space. The trio will make a rare night landing when their Soyuz TMA-05M capsule lands in Kazakhstan. At landing time, it is expected to be a cold night with an hour to go before sunrise, NASA officials said. You can watch the Soyuz landing live here via SPACE.com's NASA TV feed. "Good luck, guys," American astronaut Kevin Ford, who now commands the station's Expedition 34 crew, as the Soyuz departed. NASA astronaut Sunita Williams bids farewell to the Expedition 33 crew during a ceremony before departing the International Space Station with the homeward bound Expedition 33 crew on Nov. 18, 2012. Williams, Malenchenko and Hoshide launched into orbit in mid-July, with Williams becoming the second female commander of the space station when she took charge earlier this year. Williams, an avid runner, became ran the first triathlon in space during the mission, which also featured three spacewalks and the first official cargo delivery by a robotic Dragon spacecraft built by the U.S. company SpaceX. The Soyuz spacecraft ferrying Williams and her crewmates back to Earth is due to fire its rocket engine to leave orbit at 7:58 p.m. EST (0058 Nov. 19 GMT) and land in Kazakhstan just under one hour later. 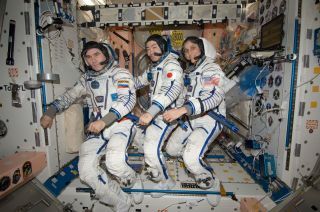 It will be the first night landing of a Soyuz spacecraft since the Expedition 12 mission in 2006, NASA officials said. A fleet of eight helicopters carrying recovery teams and vehicles will be circling the Soyuz spacecraft's primary and backup landing zones in order to ensure a swift retrieval of the returning astronauts. As Williams and her crew readapt to life on Earth, the Expedition 34 crew still on the space station will prepare for a busy holiday season in orbit. The astronaut and cosmonauts are expected to celebrate the U.S. Thanksgiving holiday on Thursday (Nov. 22) and prepare for the arrival of three new crewmembers in mid-December.